NET THREAT Sandler’s latest comedy opened in 50 countries this weekend and, to the chagrin of theater owners, not a single ticket was sold. Man, do we live in the future or what? It seems like only yesterday Netflix was this kooky company that mailed you movies. After they played in theaters. Then on pay-per-view. And finally hit DVD (even Netflix couldn't afford the postage for brick-sized VHS cassettes). Seemingly overnight, the company with the kooky mailers morphed into a television powerhouse. Then a movie studio. Even while paying the postage on millions of DVDs, Netflix somehow became the equivalent of HBO and Paramount Pictures combined. That's one spooky business plan. But for a minute there back in 2014, the company's management looked like it might've lost it. No way, scoffed Hollywood insiders, was the streaming giant about to pin its bid to take on the traditional movie industry and render the cineplex obsolete on ... Adam Sandler. Yes way. The actor made history by becoming the first star to sign on to a new model bypassing the box office and premiering new releases in living rooms around the world. (Netflix has 93 million subscribers in 50 countries.) The four-picture deal guaranteed Sandler $100 million and total artistic control. How's it working? Last month the company doubled down, locking the comic in for eight films. Turns out Sandler's comedies are the most streamed of Netflix's offerings. All over the world. Industry analysts posit that he could singlehandedly bring down the movie business. Something to ponder as you enjoy Sandy Wexler in the comfort of your domicile at the hour of your choice. And with way cheaper snacks. Sandler's third Netflix project debuted last Friday. He popped by "Jimmy Kimmel Live" to promote it. Trade publications reviewed it. Show business as usual. Except for the minor detail that not a single ticket was sold. If you own a theater chain, this might make you nervous. The film is not just historic but also fairly hilarious. A 21st-century riff on Woody Allen's Broadway Danny Rose, it offers an affectionate, often affecting character study. 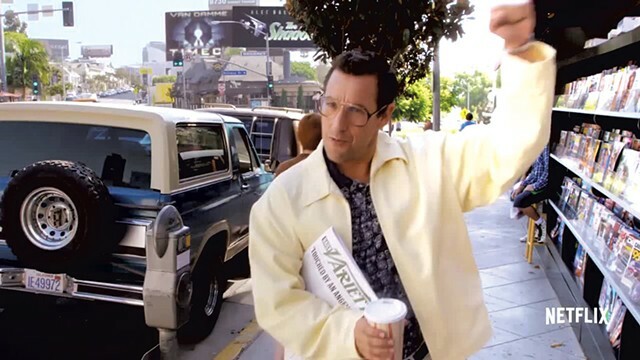 Sandler plays a nebbishy talent manager. Set in '90s LA and based on the comic's real-life manager, Sandy Wernick, the picture is a mix of the disarmingly sweet and decidedly surreal. Sandy's glasses are goofy hula hoops, his voice an annoying squawk. He dresses like a Tampa Bay retiree but will do absolutely anything for his "stable," a roster of misfit toys played by Sandler regulars including Kevin James, Nick Swardson and Terry Crews. They're the bottom of the entertainment barrel, though some of their acts are dreadful in an undeniably delectable way. Then Sandy discovers Courtney (Jennifer Hudson) singing in an amusement park. She proves such a natural talent that even he can't screw up her rise to stardom. That plot takes an unexpected turn I won't spoil. I will say that I dug this long (131 minutes! ), strange trip down memory lane (Blockbuster, beepers, Tower Records, Fruitopia). Some of the things I dug most were the weird, playful touches that Sandler plays down here — for example, his character's bedtime ritual of apologizing to clothes he hasn't worn in a while. Brilliant. Directed by Steven Brill (Mr. Deeds) and cowritten with Paul Sado and Dan Bulla, Sandy Wexler is at heart a film that celebrates loyalty. Having stuck with the same manager for 28 years and provided paychecks to pals who haven't made $100 million deals twice (yes, David Spade, Chris Rock and Rob Schneider are all here), Sander is well qualified to speak on the subject. Even in a funny voice if he wants to. Sandy Wexler is not showing in any theaters in the area.